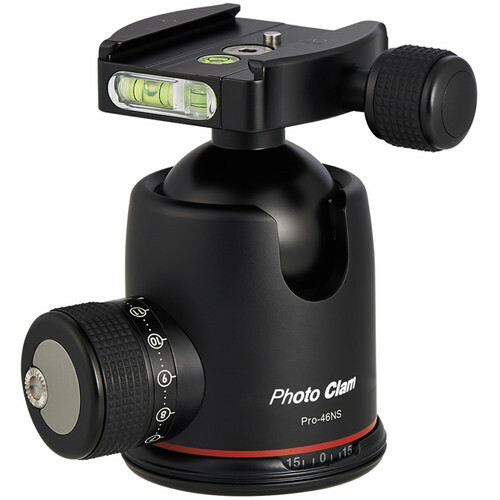 The black Pro 46NS Ball Head with Screw Knob Clamp from Photo Clam is a CNC-machined aluminum head with an Arca-type compatible clamp that opens and closes by turning the knob. The 4" tall ball head weighs 1.2 lb and supports up to 103.6 lb. Furthermore, the main knob unlocks the ball movement, and a notch in the body allows you to place a camera in a 90° vertical position. A separate pan lock allows you to rotate the camera 360° independently of the ball movement. The tension control located on the main knob of the ball head allows you to dial-in how much or how little tension you want on the ball. In addition, the CNC-machined aluminum head includes a 62.5mm quick release plate with a 1/4"-20 camera mounting thread.